Hello, he created a module for a reseller, works perfectly with the CWP API, but for mayor mayor security the data needs a CWP function that returns the user or session ID. Did you try $_SESSION['username'] ? I will be happy if you share this with us. A reseller account would not be dependent of a domain. If that domain would dropped for any reason, the account will rest inconsistent. You have a root for something. -.-! Is the security of this module thought in this same way too? 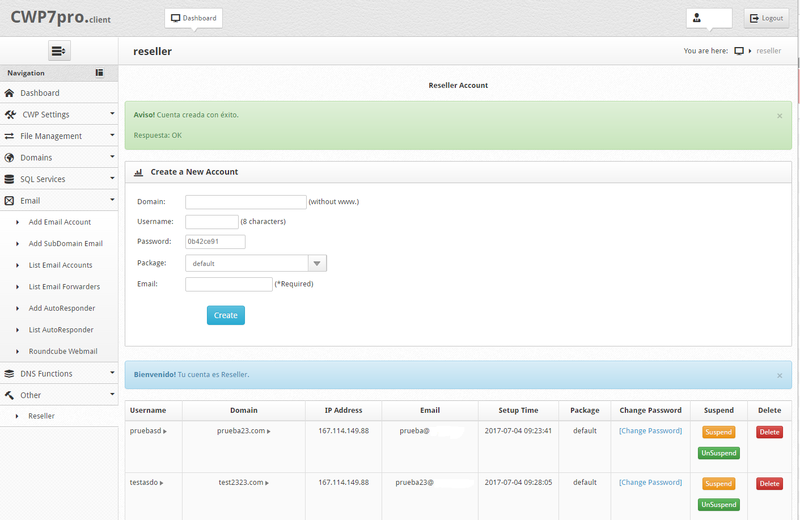 You still need to create the module for admin, currently you have to modify the "is_reseller" field to 1 if that account is Reseller. I just found this topic by accident. Sorry to reply after such a long time, but I was wondering how well this worked, or if you were able to share any other info about it. I saw that this thread, as well as the github for this script, doesn't have much activity. It seems strange for something that seems to have such potential, to be left like this. Any updates on this thefantas? Likewise, has anyone else had success using this? Hello, I still serve, I do not know why you do not take into account xD. This project seems to be dead now. Moreover, I have requested the CWP team many times to develope reseller module but they told me that they have not this on their todo list any soon. reseller part we don't have in plans for the next 1-2 months as simple we are working on the many other improvements that are coming soon. I know CWP is not dead. I was talking about that reseller project on github. Anyhow, kindly fork the project from github and integrate into CWP. My script is functional, I don't have any problems, resellers can create domains and have basic options of their associated domains, as shown in the images.